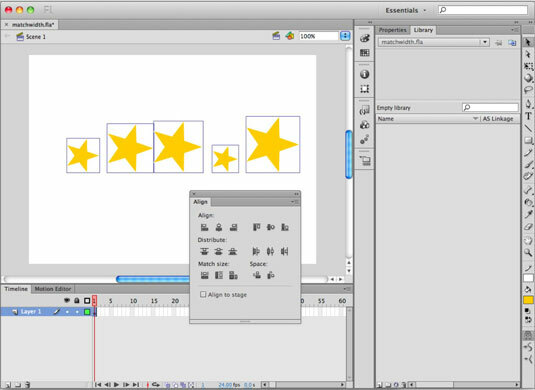 If you need to line up or space out several graphics on the stage in Adobe Flash CS6, you can use the handy Align panel to assist you. The Align panel lets you line up, distribute, or space two or more objects relative to each other or the stage. Select a graphic on the stage and duplicate it two to three times by choosing Edit→Copy and then choosing Edit→Paste. Loosely position the graphics across the stage from left to right. Select all the new copies you created with the Selection tool and launch the Align panel by choosing Window→Align. The first row contains all the Align buttons, broken down into two groups: vertical and horizontal. Locate the Align to Stage check box at the bottom of the Align panel and uncheck it, if necessary. Click the Align Vertical Center button to align the selected graphics horizontally by their top edge. The graphics reposition themselves so that they’re all flush by the top edge. Align selected graphics horizontally with each other with the buttons under the Align row. The second row contains buttons that evenly distribute graphics vertically or horizontally by their center, top, or bottom edges. Click the middle button of the second group (Distribute Horizontal Center) to distribute graphics based on their center points.